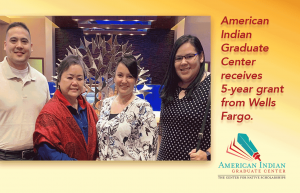 Denver – February 5, 2019 – To support greater economic empowerment in tribal communities, the Wells Fargo Foundation has awarded nearly $13 million to nonprofits supporting American Indian and Alaska Native communities as part of a five-year, $50 million commitment to expand its focus on tribal philanthropy. The funding will help increase homeownership, energy sovereignty and workforce development on tribal lands, promote development of native owned small businesses, and help build capacity for nonprofits to better serve their clients in Indian Country. Capacity building for native nonprofits. Native nonprofits serving critical needs in Indian Country — including the National Indian Council on Aging, the Indian Land Tenure Foundation and the American Indian Science and Engineering Society — received awards to build their organizational capacity and expand services.